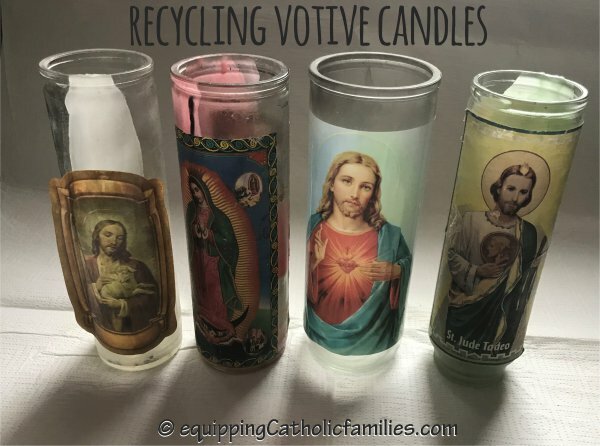 Our first step was to gather all of our mostly-used votive candles and clean off the soot and remove burnt wick pieces. 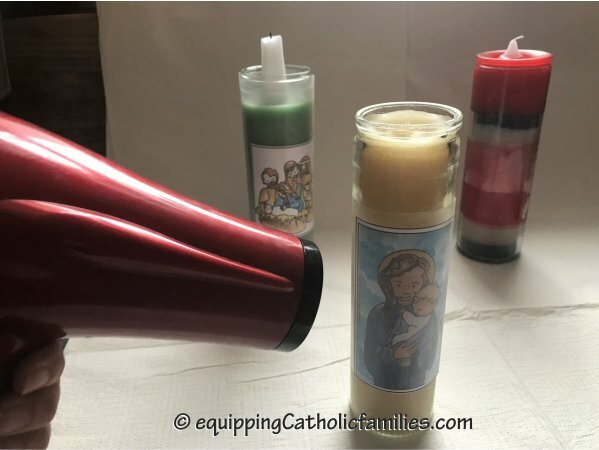 If the original holy images are still in good condition, you might be able to keep them like that if you’re creative about melting the wax. 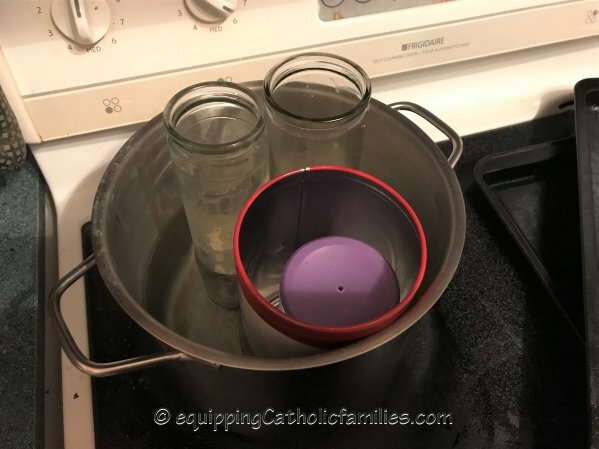 If you sit the candles in a pot with an inch or two of boiling water (when you’re boiling the wax), the images may get a little damaged. Microwaving might work…we just didn’t try that. Lucky for us, we wanted to remove the images anyway to replace them with our favorite Kelly (patron) Saints! We found it pretty easy to remove the images after soaking the candles in water. 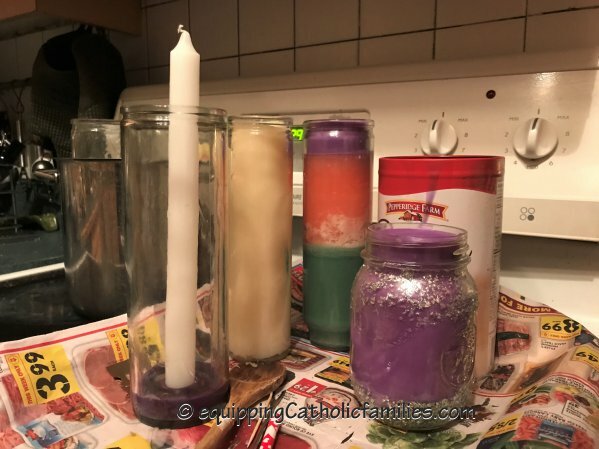 We sat the glass votive candles in a pot with an inch or two of water to melt the wax. We found an empty cookie tin to melt additional candles for the wax. We made sure any remnants of wicks were removed from the hot wax. We didn’t have any new wicks from the craft store on hand, so we used candlesticks! The trick is to hold them in place while melted wax is poured in around the candlestick. The candlestick needs to be secured in place until each layer or ‘pour’ of wax sets. 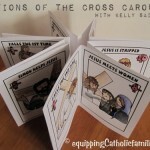 We chose our Kelly Saints images from this craft kit (14 Saints to choose from!). 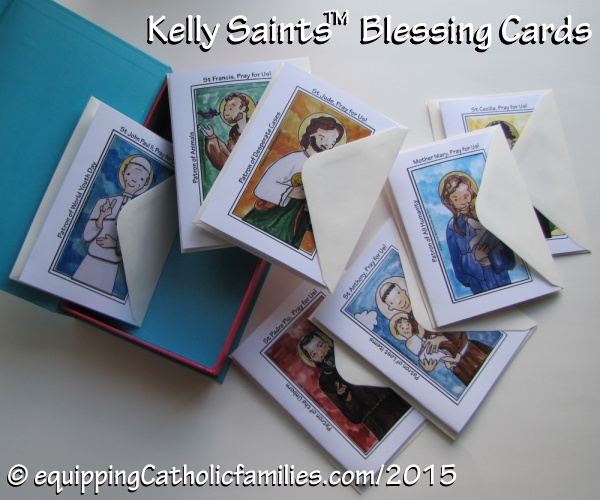 You could also paint your own Kelly Saints with the black and white templates in the Saint Scripts Craft Kits. 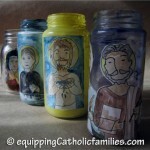 Across these three craft Kits, there are 64 Saints! Alternatively, the images of the Lock Screens are only $2 each and they include the text of a prayer prompt on each one. 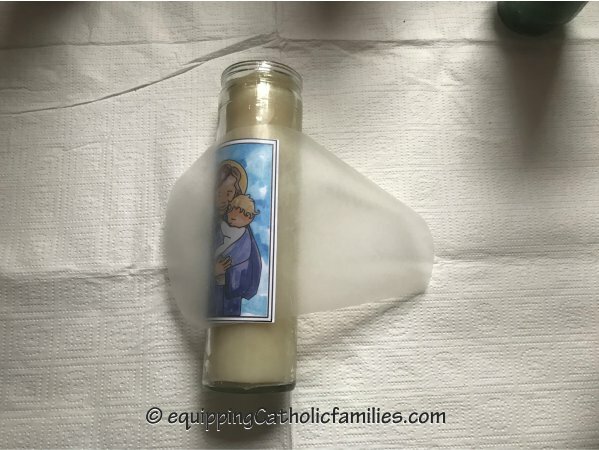 The jpegs are close to 4″x7″ so they can accommodate most glass votive candles. We cut out the images, tacked them in place where we wanted them on the outside of the wax-filled glass votives. We then cut a piece of wax paper that fit the full circumference of the votive glass with a tiny bit of overlap (1/8″). The wax adheres pretty well to the glass pointing a hot air hairdryer evenly across the wax paper, smoothing out any bubbles as you go. (but be careful, it can get hot!) 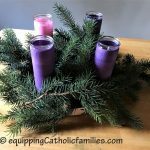 The wax can actually drip a little, so you might want to wear an apron or old clothes…and cover your table top surface to protect it from melted wax. We ended up giving them all away for Christmas…so it’s already time to make some more! 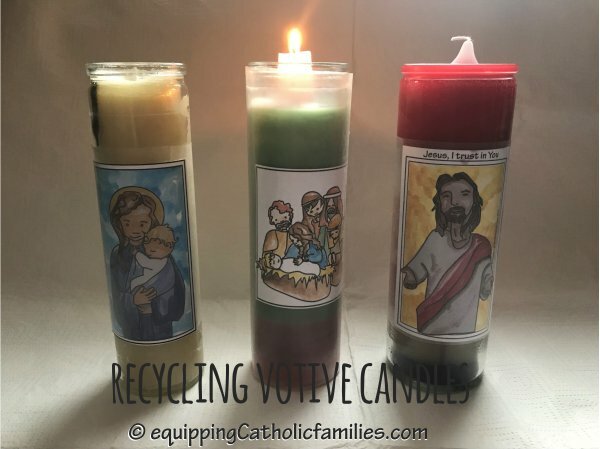 Do you have any old votive candles and stubby candles lying around?